Few things are worse than getting stuck at an airport for an indefinite period of time because of a delayed or missed connection. When you think of the shear logistics of trying to organize thousands of jets going every which way in the air, it seems a miracle any of them ever get anywhere. But thoughts about the complexities of flight control don’t help the fact that sometimes you just have to sit on a cold, hard seat for hours on end in order to get somewhere. I initially read about Napcabs on a helpful site called Airports Made Simple. 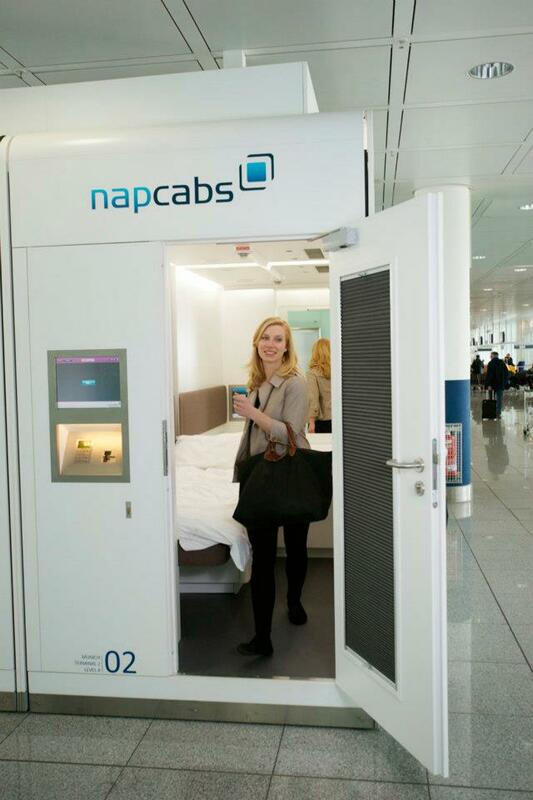 I found the information really interesting and, after digging some more, discovered that the concept of sleeping booths seems to be catching on in Europe and in Asia, but not in the US for some reason. I also found a website called “Sleeping in Airports” that rates airports based on how easy or difficult it is to sleep at them. The worst I’ve ever experienced myself is about a 12-hour layover but usually by 3:00 AM a flight would arrive to get me on my way before dawn. Using one of these booths is not cheap. Napcabs gets around $40 for three hours (the minimum) and doesn’t advertise the hourly rate after that but we can guess it’s around $12-15 per additional hour. The Russians suggest $15 per hour for their service, but that can run as high as $60 for a whole night if at a hostel. So it boils down to how much you’re willing to shell out to be comfortable. The pictures here will give you an idea of their size and how much space you get. Sorry fellas, the gals don’t go with the booths. I could go on and on about my own travel experiences but my whole point in even bringing this up is to let people know that there may be alternatives to sleeping on the floor if stuck at an airport for any reason. The holiday season is always a tough time to fly due to crowds and the possibility of bad weather, so being prepared for the worst is definitely advisable. If you do happen to see an American versions of the sleep booth please let me know and I’ll check into it for a future column. In the meantime, happy (and safe) flying for the holidays this year! This entry was posted on November 27, 2012, 8:01 pm and is filed under The Backstory. You can follow any responses to this entry through RSS 2.0. You can leave a response, or trackback from your own site. I’m assuming they’re only meant for one person? I can these turning into all sorts of other things other than “napping boxes”.